If you still use .Net framework 2.0, the way to reference a web service to your project is to add a Web Reference. adding an app.config to your project. The app.config will contain the configuration under applicationSettings of the newly added reference of the web service. The app.config will look like this for example. What if you want to use one config file? 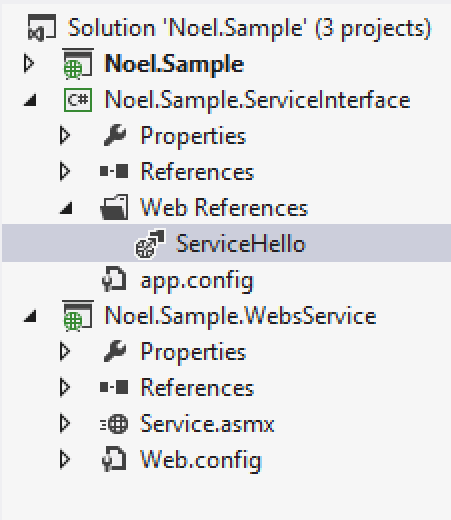 the section of the web service from your app.config to your web.config. The section group can be added to the configSections. The applicationSettings can be added under the configuration section of the web.config. Under appSettings of a Web.config file usually you use for example ConfigurationManager.AppSettings[“WebServiceURL”] to get a value in the Web.config. But when the URL is under the applicationSettings in a Web.config this is how you can get the value of the URL. The last step is to remove the app.config from the class library. This is the case if the app.config was added to have the configuration of the web reference. In other cases where you need to the app.config, just remove the configSections and applicationSettings for the web service. I spent some time looking for a way to make this work and not too much resource from web points to this approach. Hopefully it can help solving yours in less time. Thank you for this post from Stackoverflow on how solve this problem.